SM Contact designs and produces splice crimping machines for a wide range of electrical components: wire, PCB, coil frame, metal tab, capacitor, sensor, diode, transformer, lead frame, resistor, textile, filament, etc. 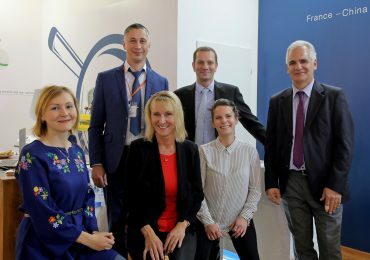 We start each project with profound connection and tooling qualification to define its optimal parameters, to adapt machine specification, and to match industry norms. Depending on the configuration, equipment performs insulation stripping, single or multiple splice crimping, inline quality control, and defective products removal. Choose one of SM Contact equipment configuration to manufacture gastight, vibration resistant, compact connection with low electrical resistance. 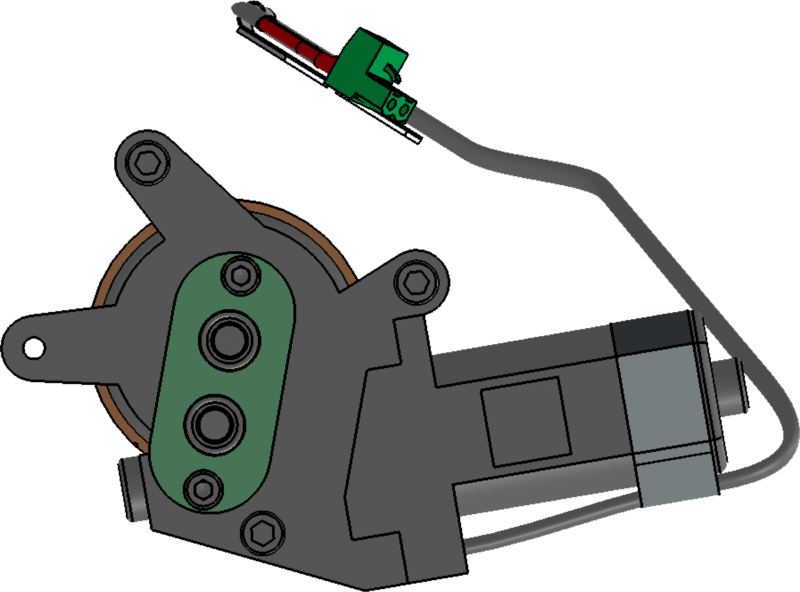 SM Crimp 2000 Standard operation includes components manual positioning, when operator holds components within the splice area, and splice crimping by pressing the pedal. The tool cassette can be designed for a wide range of wire cross-sections, e.g. 0.5-1.5 mm2. What is more, changing only the cassette it is possible to perform various connections with the same splice band. In contrast to the machines assembled from separate parts by screws, SM Crimp 2000 cast iron frame warrants perfect stability during crimping. Splice band is defined according to the type of application and environment temperature range: splice band type and material (brass, brass with tin coating, chrome-nickel, chrome-nickel with tin coating, stainless steel), thickness (0.2 – 0.53 mm), length (1.5, 2, 3, 4, 6, 7 mm), and height. Crimp height adjustment panel contains a dial and an alphabetical indicator to set up an appropriate crimp height if necessary. Rubber surface of a feeding wheel prevents damages of the splice band. Special sensor controls the length of each splice. All the controls except the power switch are located at the control panel. With 5 buttons and a display it is possible to control the quantity of products, inputs and outputs, interface language, tooling technical data, feeding system and activate emergency stop. Interface is available in different languages. Hand wheel is used to perform manual cycle for testing the system before production, i.e. centering the clincher. 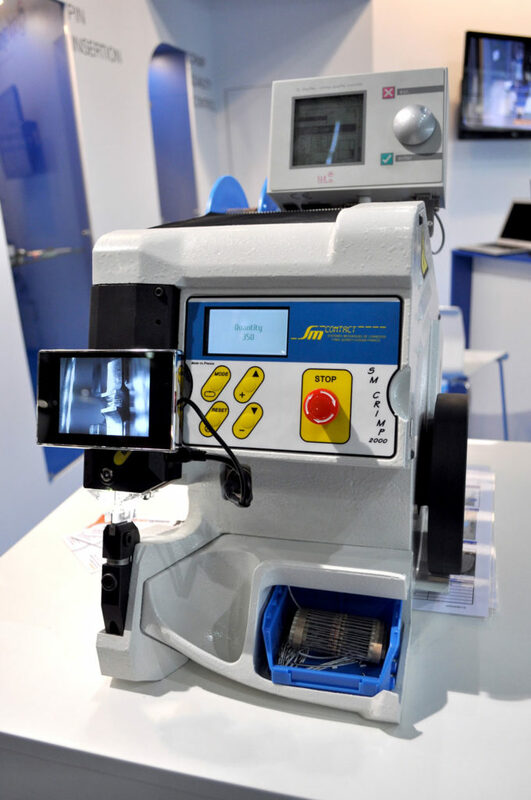 Wheeling moves the punch down and allows to monitor splicing process in general as well as positioning of the tooling. Tooling set includes clincher, anvil, punch, punch guide, and cutting block. Such parameters as clincher type, clincher size, and punch tip shape are customized for the application. Inclined clincher surface, smooth cutting surface, quick-change tooling cassette, and finger guard lighting cap guarantees efficient & safe operation. Integrated memory keeps application parameters, recommended settings and spare parts list. CFM captures force-time curve and detects any deviation from the quality tolerances. System works with many types of splicing and crimping machines and suites well to any application requiring inline monitoring of forces. The reference curve of CFM corresponds to crimping force, but in fact it can reflect such quality deviations as: missing wire strands, inaccurate components positioning or crimp height, insufficient insulation strip length, insulation in the splice area, etc. CFM also allows to adjust automatic cutting and/or rejection of defective items. Built-in camera shoots the clincher area and transfers the image to the monitor in real time. Thus operator is capable to position components precisely. Cutting unit cuts the components after splice crimping so that their ends protruding out of the splice band from one side are of equal length. It suits wires of up to 1,5 mm2 diameter. CFM and cutting unit can be integrated to cut defective parts in halves. Laboratory equipment allows to control whether the splice quality matches industry norms or any other special requirements. 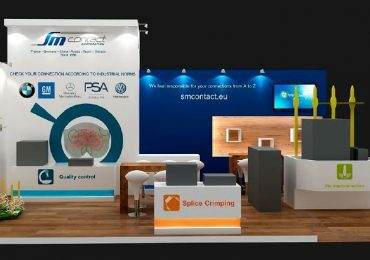 Check our micrograph laboratories, pull force and crimp height control tools, as well as specialized measurement software. SM Crimp 2000 Advanced operation involves components manual positioning to the fixture. Each fixture is customized to the corresponding components. Fixture is moved between loading and work positions manually by operator or automatically. In both cases these positions are predetermined to guarantee precise splice crimping. Splice crimping is performed by pressing the pedal or automatically. Tool cassette can be designed for a wide range of wire cross-sections, e.g. 0.5-1.5 mm2. What is more, changing only the cassette it is possible to perform various connections with the same splice band. In contrast to the machines assembled from separate parts by screws, SM Crimp 2000 cast iron frame warrants a perfect stability during crimping. Splice band is defined according to the type of application and environment temperature range: splice band type and material (brass, brass with tin coating, chrome-nickel, chrome-nickel with tin coating, stainless steel), type, thickness (0.2 – 0.53 mm), length (1.5, 2, 3, 4, 6, 7 mm), and height. All the controls except the power switch are located at the control panel. With 5 buttons and 1 display it is possible to control the quantity of products, inputs and outputs, interface language, tooling technical data, feeding system and activate emergency stop. Allows accurate positioning of the components. Fine adjustment of the height position of components. Prevents double crimps in same position. Machine has a sensor detecting jig presence on a fixture. Manual fixture is moved by operator between loading and work positions manually. Automatic fixture moves between loading and work positions automatically with servomotor. Removable or build-in part of a fixture that perfectly fits the shape of components and thus allows its precise positioning. If machine has 2 jigs, while one is processing, second can be reloaded by another operator. Jig could be adapted to the components depending on its quantity, shape, materials. CFM and cutting unit could be integrated to cut defective parts in halves. Requires two hands touch to start the cycle to eliminate hands presence in work zone. Allows controlling utilization of NG/NOK components. If CFM detects quality deviation and estimates connection as NG/NOK, then machine stops operation and waits until NG/NOK component is placed to POKA YOKE bin. According to the selected program, high/low definition camera takes picture and controls components` position, color and stripping length. High or low definition is selected depending on size of components. HMI system shows the complete work algorithm, indicating the current step and step when the failure occurred if any. It can be displayed as an algorithm graphics or product visualization. HMI provides intuitive process control. It is possible to readjust all the sensors, including CFM to the other product by choosing the corresponding program in the interface. Within password protected area one can switch machine subfunctions on/off. 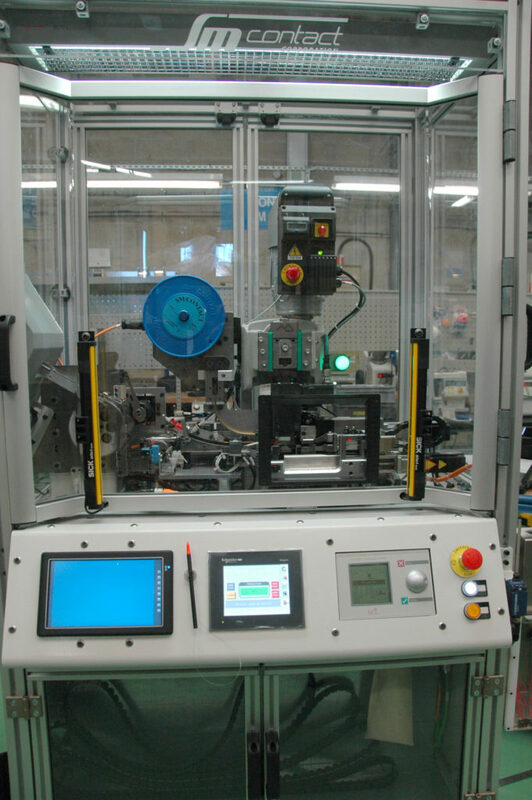 Machine and all its components can be integrated into floor mount frame with PLC and HMI units for operation control. Safety beams can be installed on the frame to detect foreign object presence and to stop the machine. This feature as well as work area lighting guarantees operator’s safety. 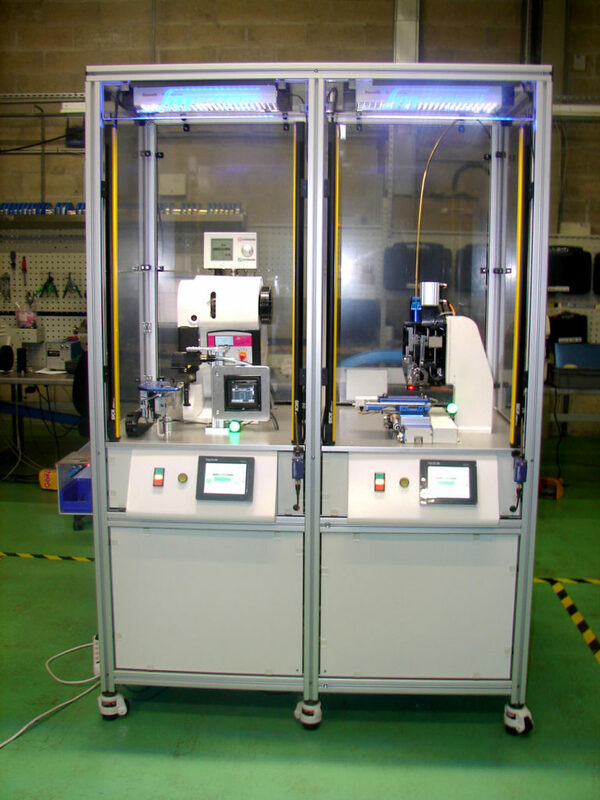 Two machines are used: one set up for one splicing type, another – for the second. This solution makes process faster and perfectly fits if product consists of different sized crimping. 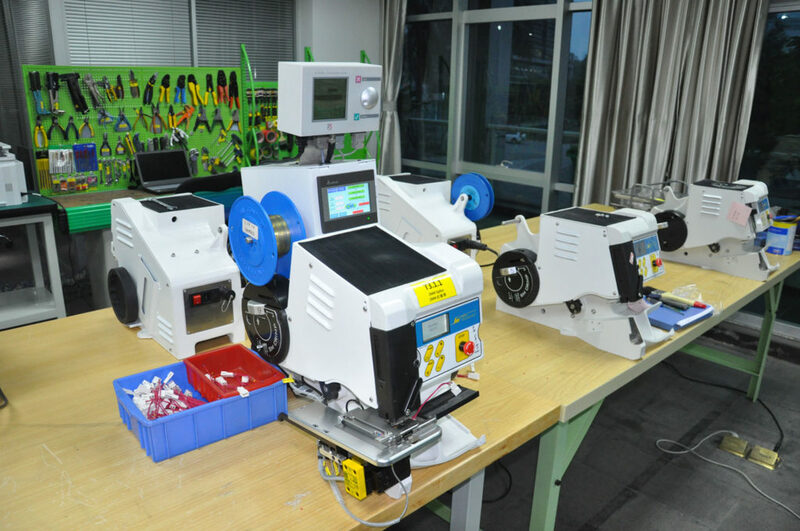 SCS (Splice Crimping Station) provides all required manipulations for customized splice connection: straightening, cutting, stripping, twisting, splicing. All the steps can be controlled by camera. Electrical setting of machine height allows sitting and standing position of operator. Each fixture is customized to the corresponding components. Fixture is moved between loading and work positions automatically. Thus, all the processes run fast and precisely. Tool cassette can be designed for a wide range of wire cross-sections, e.g. 0.5-1.5 mm2. 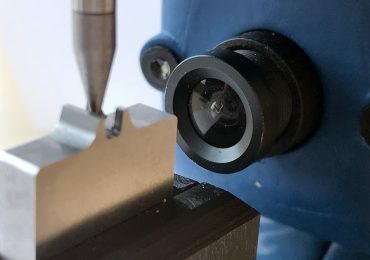 To perform another connection on the same machine it is necessary to change cassette and tooling. Inclined clincher surface and smooth cutting surface guarantees efficient operation. Allows accurate positioning of the components being adapted to its quantity, shape and size. Fine adjustment of the height position of components. Fixture moves between loading and work area automatically with servomotor. 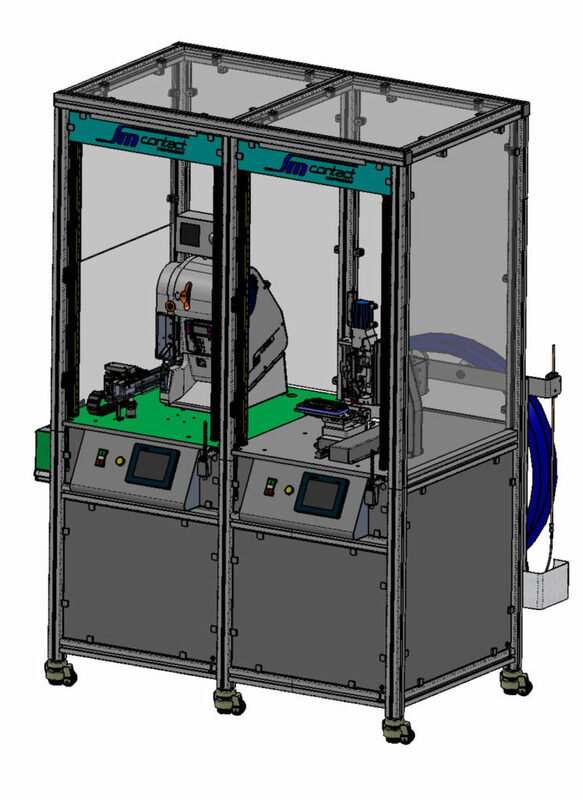 Automatic manipulators transfer components in three axes from one unit to another to provide straitening, cutting, stripping, twisting, splice crimping and unloading. Each manipulator is customized to fit application. It prevents damage and guarantees precise and safe operation. Electrical setting of machine height allows sitting and standing position of operator. Ensures a comfortable way of working for the operator (from 850 to 1050 mm). Polycarbonate cap covers work zone of SCS, dividing it from the loading area. It provides operator`s safety and allows loading of components while the previous connection is being processed. Container for operator to collect proper parts fast. Wires straightening is proceed by combing. Cutting unit cuts the wires after splice crimping in order to get wires of a same length. It suits wires of up to 1,5 mm2 diameter. Stripping length (until 7 mm) and knives penetration into insulation is set by micrometer. Waste removal in cutting and stripping area is performed by a vacuum cleaner. Movements of all the stations are driven by a step motor. HSCS is designed for high-speed automatic connection of wires and connectors. Feeding of all components is synchronously performed by motorized manipulators. Various additional options are available on demand: straightening, cutting, stripping, twisting, etc. Such quality features as components presence, stripping length, and crimp force can be assured by camera and laser control, CFM and other systems. Cycle time (manual wires loading and connector unloading) 6-7 sec. Cycle time (automatic wires loading and connector unloading) 5 sec. 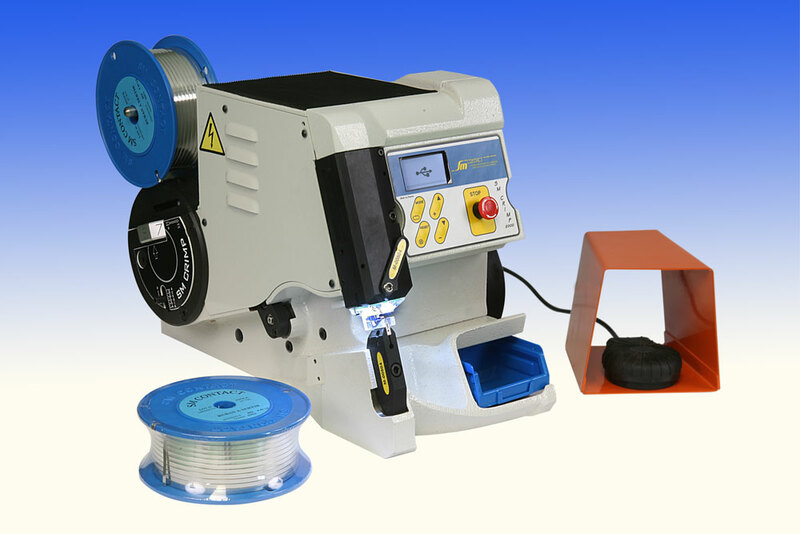 If plastic connectors are supplied in embossed carrier tape, then the tape is automatically unreeled, the cover film is removed and the connectors are transferred by special manipulators to the clincher in the splicing area. Connector manipulator is customized to fit the component perfectly. It prevents damage and guarantees precise positioning. 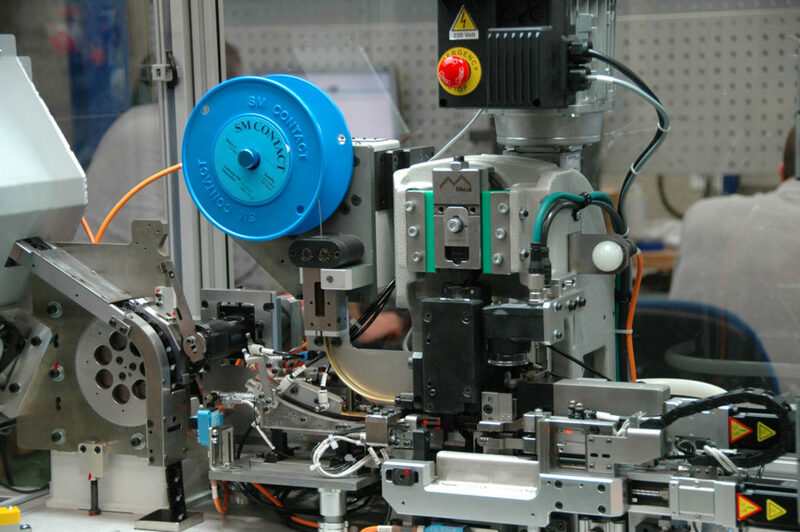 Automatic wire manipulator transfers wires to the stripping unit and then to the clincher in the crimping area. 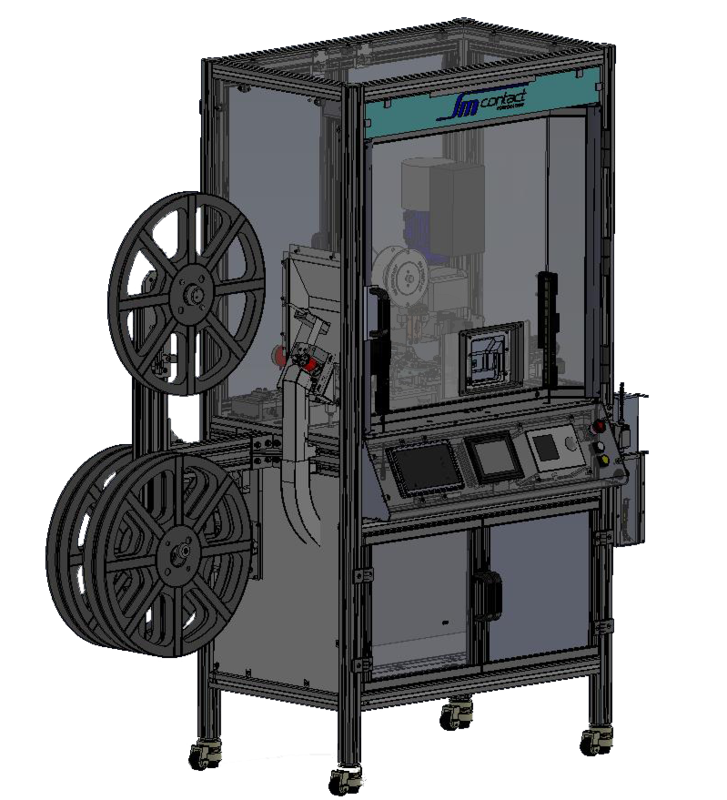 Wire manipulator is customized to fit the component perfectly. It prevents damage and guarantees precise positioning. CNC stripper is equipped with two brushless servomotors, one is for blade motion, and the second is for transfer of wire manipulator to splice clincher. Stripper could be adjusted by HMI for precise jog mode. Stripping length is managed by mechanical stopper equipped by micrometer screw from Mitutuyo. Wires could be cut before stripping to get the equal length. Option for connectors fed in-bulk. A bulk supply hopper automatically doses parts into the vibratory bowl and inline vibrating conveyor. Cutting unit cuts unused metal leg of the connector if necessary. HMI provides intuitive process control. It is possible to readjust stripping cutting depth and all the sensors, including CFM to the other product by choosing the corresponding program in the interface. Within password – protecting area one can switch machine sub functions on/off. According to the selected program, high/low definition camera takes picture and controls wires color and presence as well as final assembly . High or low definition is selected depending on size of components. Laser control allows to monitor tape and interface presence. 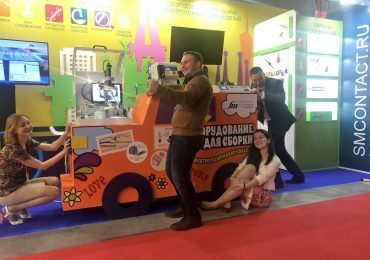 This year at ElectronTechExpo (Moscow, April, 17 – 19) SM Contact displayed a wider range of laboratory equipment including motorized pull force tester EPT 1000 with upgraded interface and novel device for splice crimping height measurement CrimpiX, besides SK 4000 for splice quality monitoring. 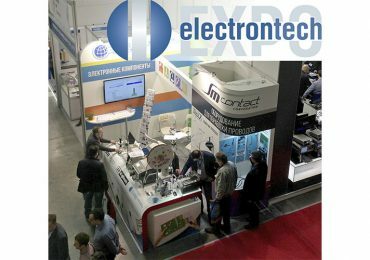 This year SM Contact for the second time in a row presents its production and engineering services at the exhibition in Moscow in April, 17-19. electrontech is the leading platform gathering technologies, equipment and materials for electronic and electrical industries. Leave caliper and micrometer in the past. Now you have CrimpiX – digital crimp height measurement device with a clincher adapted for each specific connection. Perfect shapes’ match guarantees precise positioning and reliable measurement results. We started again from scratch, full of big hopes for success, happiness and health. And we wish you to fill new year’s 365 “pages” with exciting stories, romance novels, heroic sagas and touching poems. Let it be full of light and kindness, shared with beloved people and the world.